The 2017 Dog horoscope predicts that you will feel more energized and in control of your life this year. But make sure that you do not waste these feelings. Make positive changes in your life this Chinese new year. Do what makes you happy right now. But make sure that your current choices will not affect your future in a negative way. Overall the Chinese 2017 horoscope for the dog tells you to have fun now, but prepare for the future. Dogs are man’s best friend because of all of their great traits: loyalty, friendliness, and sincerity. Chinese astrology uses animals as their signs. And if you fall under the year of the dog then it is likely that you share many great traits with this animal. You are likely a dog person if you were born in any of these years: 1946, 1958, 1970, 1982, 1994, 2006, and people who will be born in 2018 will also be dog people. Like actual dogs, you can always count on a Chinese zodiac dog person to make a faithful friend. They will always be there when you need them. They do better in one-on-one compared to being in a group. They are likely to have a talent or other quality that will make them stand out in a group. Let’s now take a detailed look at the 2017 Dog predictions for the Year of the Red Fire Rooster. The Dog 2017 horoscope forecasts that your emotions will seem to stabilize this year. Or at least they will be more stable than they have been in years past. While your emotions may have made your relationships more passionate in the past, having more stable emotions will prevent more fights in the present. You can work on conversation skills in your relationship this year. Discuss what you want to happen in your marriage even if it is having a child instead of relying on your feelings to pass along the message messily. The 2017 Chinese horoscope predictions for the Dog foretell that year is especially good for your social life. You are more likely to be happy while you are with your friends. There is hardly a dull moment when you are with the people who you care about. This is also a year for social transformations, which could mean that your relationship could reach the next level filled with sexual passion. 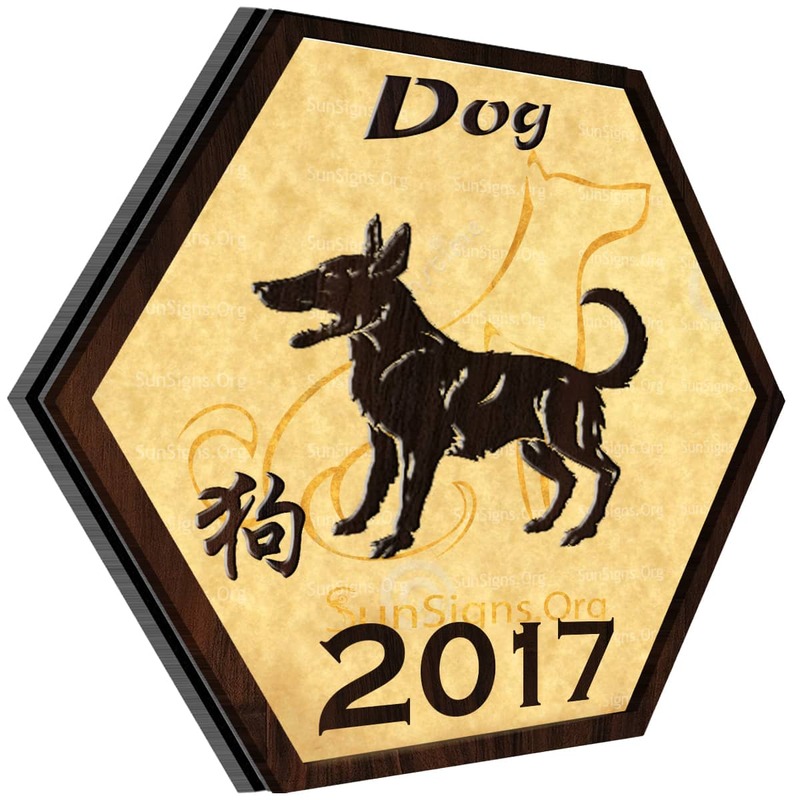 The Dog horoscope 2017 predicts that this Chinese lunar year 2017 is a year to look at all the opportunities around you, at least in your career and business. Many Dogs are not happy with the job that they have. They only work for the paycheck and wait for the weekend to come. However, make sure that you don’t jump ship before knowing all of the details of what is to come. If you want a new job, make sure that you have it secured before you quit your current job. Who knows? Maybe if you wait out your boring job, new opportunities will come to make it more exciting. The year of the Rooster 2017 predictions for the Dog forecast that your finances are likely to be balanced or more stable this year than they have been in past years. Pay off your debts, and save your money. There is likely to be an unexpected expense in your future, so make sure to save up for that. The Dog horoscope 2017 also predicts that you may not feel at your best at the beginning of this Chinese New year. But as time goes on your year will get better. As the year goes on, you will also feel like you have more energy than normally. Take advantage of this energy spike! Work out and keep your body healthy. In fact, 2017 is actually highly conducive for the Chinese zodiac dog to exercise and for beginning diets. While it might not be easy, it will pay off for sure. Also, work on controlling your stress levels this year. The Feng Shui predictions for the Dog in 2017 foretell of some conflicts in relationships but wealth and study opportunities exist. The Dog horoscope 2017 suggests that this year you are bound to feel more in control of your life than you have been in past years. Because of this, you are also likely to feel happier than usual. Your friends will bring joy to your life.